New syntheses of a novel polymeric material has been reported a multi-institutional team of researchers including EFree Affiliated Scientists from Carnegie and the Spallation Neutron Source (SNS) at Oak Ridge National Laboratory (ORNL). 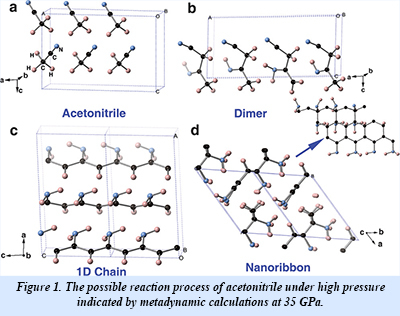 Experiments carried out on acetonitrile (CH3CN) using the SNAP instrument at SNS showed that under pressure up to 23 GPa the material transforms to a solid yellowish polymer or a black, carbon-rich material. Subsequent electron microscopy, infrared spectroscopy on the material, together with computations were also performed. The results showed that nitrogen was released from the acetonitrile to produce the carbon-enriched material. The material imaged using electron microscopy had onion-like layers - one shell of carbon sheet after another. Because a temperature-based catalyst is usually required to convert a polymer into another material, this ability to cause the chemical reaction through pressure alone is unusual. There are interesting implications beyond materials science. Acetonitrile is one of a number of organic compounds that have been discovered in outer space and is thought to be implicated in the origins of simple amino acids, one of the basic molecules of life. In a cosmic event such as an asteroid collision, the pressures and temperatures generated can be very large, and in the presence of acetonitrile, could mimic the experiment the researchers conducted at SNAP. Using this process with the addition of oxygen, possibly by the addition of carbon dioxide or water into the reactants, complex carbon structures similar to the kind suspected throughout early formation of amino acids on Earth may be realized [H. Zheng et al., Angew. Chem. Int. Ed. 55, 12040 (2016)].